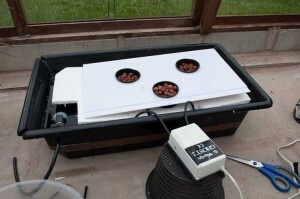 This is the last Hydroponic system I am setting up to grow strawberries in this year, This system is based on a method called Water Culture, Raft system or as I like to call it my bubbler system. As you can see if you have a look at the pictures within my post here Time based Photo’s I’ve already used this method and quite like the results. 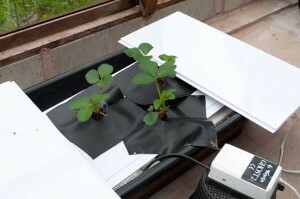 It’s quite a simple method of growing and I like it because there is no nutrients being pumped around and due to the tank just being solid with no drain or pump holes there is less likelihood of any leaks. 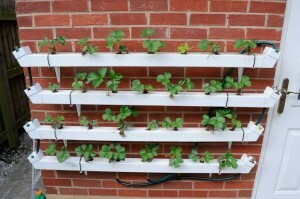 I’ve already got two small NFT tank systems available for me to play with so I thought I would use one of these as a strawberry growing system this year. The system consists of a tank which holds nutrient solution and also an air pump which in my case is a Aquarium Ghost 2 Air Pump, I’ve tried several different air pumps previously but this one is the only one I’ve found which seems to provide enough air without spending too much money and is also pretty much silent. 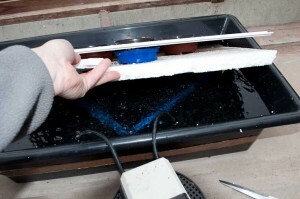 The air pump is connected through a small length of air tubing to two large aquarium air stones, These are very cheap and do a good job of supplying bubbles of air throughout their whole length. The strawberry runners are placed in the usual net pots I have filled with clay pebbles with their crowns above the pebbles but only just, These pots are then pushed through some thick pieces of polystyrene which I’ve cut holes in. The purpose of the polystyrene is to allow the plants to float on top of the nutrient solution, Hence the name the raft system. The plastic squares of black plastic you can see in the photo’s covering the clay pebbles is to try and stop any algae growing on the pebbles, It is actually cut off pieces of old pond liner. As this is only a small test setup, I’ve only got enough room for growing 3 strawberry plants in this system and the air produced from the air stones is only really enough to cover the roots of the 3 plants. 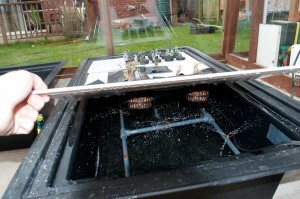 I’ve positioned the air stones diagonally underneath where the pots float so each of the plants is guaranteed a good supply of air rich nutrients. The roots should soon suspend into the nutrient bubbles. As you can see from the photo’s here this system is also working well currently. I’ve had a camera in my greenhouse for a few years now. I’d forgotten until recently that it had been recording a photo of the greenhouse on a daily basis. After seeing all the photo’s I though it might be cool to put them all together and make a little video of my plants growing over 3 seasons, within the video you can see all the cucumbers and tomato plants growing on either side of the greenhouse and all the propagation going on in the middle. With the occasional winter cabbage plant or Brussels sprouts in the middle. I think it’s interesting, Hope you do to. You even see the greenhouse building it’s own new floor at the end.